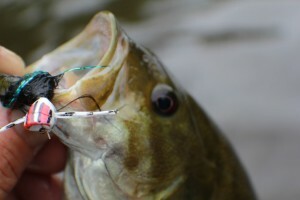 Muskegon river smallmouth bass taking both topwater “poppers” and subsurface baitfish and crayfish imitations. The Muskegon river fishing report for August 18, 2018 in the Newaygo, Michigan area is about the continued low water we’ve seen over the past week+. With this being one of our hotter summers on record, coupled with not much measurable rain in the upper portions of the Muskegon river watershed, has the river running low and clear. Click HERE for current weather information. That said, there are still Smallmouth Bass, Northern Pike and Walleye to fish for, we’re letting the resident Brown and Rainbow trout take a break during this time of summer. Trout are susceptible to higher mortality rates when caught during the peak of warm water season and we’ll see them soon enough feeding on fall insect hatches and shortly after, loose salmon eggs courtesy of the spawning Chinook salmon. With both fly fishing and light spin gear, we’re fishing likely holding water for “bronzebacks”, “toothy ones” and “eyes”. Due to present river levels, we have been fishing sections down river from Newaygo with good success. As cooler nights make their way into late summer, we’re hoping for some supporting rains to get all west Michigan rivers up and flowing in preparation of the fall salmon run. Some rivers already have migratory salmon in them and I will be pursuing them this coming week in the lower reaches of the Pere Marquette river. This will continue for me up to mid/late September and then I will work my way back down to the Muskegon river for the rest of the fall season, which goes right up to Christmas while we chase fall/early winter steelhead. Click HERE to read a short article on fall Salmon fishing in rivers. Present water flows just above 900 cfs, with 72-73 degree water temperature in/around the Newaygo area. Click HERE for full details on current river conditions.